It’s a card from St. Jude Children’s Research Hospital. My friend had it on her dining room table and it caught my eye so I photographed it to share the message. The three kings made it to the manger at my friends’ home. The Christmas/Epiphany spirit was still in full celebration this morning. What a lovely spread. I had coffee and cookies with milk poured from a cute cow pitcher. We caught up on our latest family adventures and remarked how quickly the grandchildren are growing. It’s always good to enter a place where you are loved. Take time to connect with positive and kind friends. Looks like I’m having coffee all by myself and now realize I should have made sure another cup was in view. This pic doesn’t tell the whole story. A lovely gift arrived from my friend Joanne. All wrapped carefully inside a cardboard box. I hung it on the tree as soon as I released it from the bubble wrap. I held the little fox to pose in front of it before we put him on the top of the tree. Here is my friend Vincie in my living room, holding a Bodhi Wind original portrait painted in 1965, She had just picked it up from the framer’s where Jennifer Panza had helped her select the frame and matting. Vincie brought it in and we unwrapped it so I could admire the framed portrait. I’d gone with her to help get it framed, weeks ago. It’s a really good story. In that post I wrote about my friend Steve reading an article in the Pittsburgh Post Gazette by Joe Smydo about what to do with the artwork of an artist who had passed away. When he read the article, he kept asking me if my friend Vincie knew Bodhi Wind since he’d graduated from her alma mater, Perry High School. After a couple of weeks of him asking if I had checked with Vincie if she knew Bodhi Wind, I finally remembered to ask her. “Vincie, Steve has been on my case to ask you if you knew a Bodhi Wind who graduated from Perry High School who was an actor in LA”. Steve had mentioned the murals Bodhi Wind painted for the Robert Altman film 3 Women No, she didn’t know him. So a few days later the three of us are in the car and it comes up again. Steve is determined. Asks Vincie himself. Turns out I messed up by asking about an actor when I should have inquired about an artist. When we got home, Steve got on the computer upstairs and called Vincie to come and read the article. And there was the missing clue. Bodhi Wind had changed his name. For more information it said to contact his mother Mrs. Kuklis. Vincie said, yes, she knew him. Yes, Vincie and Charles (Chip) Kuklis not only went to High School at Perry together but they were classmates in elementary school. Steve was insistent that she must have known him and not only did she know him but they were very good friends in elementary school, too. Not only did his mother have the portrait he painted of Vincie in high school, Mrs. Kuklis had set in out on a special chair for Vincie to see, and Mrs. Kuklis asked Vincie if she would like to have it. Oh my! The gift of a well chosen book. When I went to breakfast with my friend R a couple of weeks ago, she presented me with this book. She’s found it in a Wisconsin bookshop, months ago and saved it for my birthday. Tonight I photographed it with a candlestick and the pair of socks, almost complete- I’m decreasing the toes. You see this poetry book is printed by Candlestick Press! It’s one of their “Instead of a Card” pamphlet series. There’s even a poem by Emily Dickinson. Thank you for the perfect poetry book for me and the bookmark’s thoughtful inscription. I sit and knit. And knit. And knit. 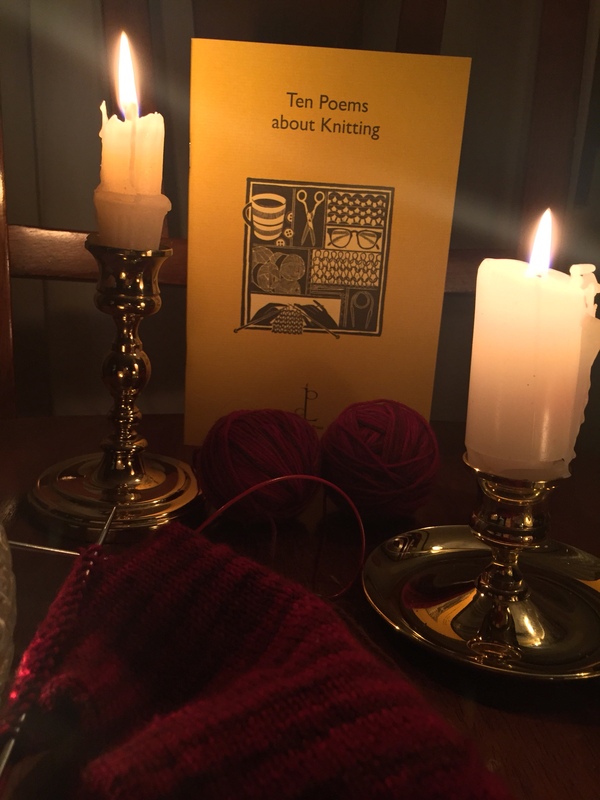 And read poems about Knitting. First in a series about Venardo’s Circus. This photo taken (after the excellent performance) by my longtime friend Joanne’s daughter, Anna. Thanks,Anna. The performers graciously and patiently pose with any and all circus-goers who wish to have their photo taken . Photo series I took of the circus will start on Sunday’s post. More to follow. Thursday I arrived in Omaha. After lunch my friend Joanne took me to a couple of local yarn shops. I like to buy souvenir yarn from places I visit, usually a single skein of local sock yarn. I got in the peacock pen to photograph the skein of Acid Peacock yarn by One Twisted Tree at ImagiKnit. Today at her friend’s farm and I tried to take a photo of the yarn AND the peacock. You can see the focusing issues I experienced. Joanne took the next four photos. A trunkful of yarn. Hotel morning selfie she took with her timer on. Me coming out of the peacock pen.